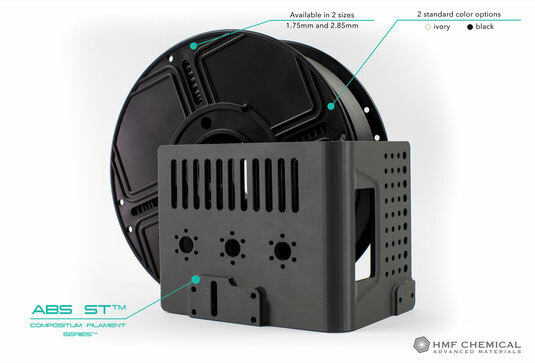 Compositum ABS ST™ - ABS materials are dedicated for industry and professional application in close chamber FDM 3D printers. ABS ST™ material compared to the ABS EX™ is characterized by increased melt flow and greater flexibility. The great flexibility of printed models allows it to be used in the production of thin-walled components subjected to alternating bending, electronic housing components etc. ABS ST™ filaments are marked by excellent cohesion of layers and very low linear contraction (up to 0,4%). Thanks to it the difference in mechanical properties of the printed sample compared to the model produced by the injection method is only 8%. The ABS ST™ filament, as well as the entire Compositum filament family is characterized by a low emissions of volatiles and very low absorption of moisture, thanks to that the moisture absorbing substance is no required. The strength tests performed on the printed samples represent real strength values of the material, obtained by FDM spatial printing. While using ABS ST™ with open chamber 3d printers, it is recommended to use side panels to stabilize the print temperature and reduce thermal stress.